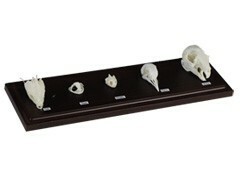 This display set features real skulls of a specimen in each of the five classes of vertebrates: Mammal, Bird, Reptile, Amphibian, and Fish. 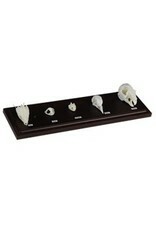 A great way to compare and contrast the skulls of animals found throughout the animal kingdom! Display will typically feature a Rabbit, Pigeon, Lizard, Toad and Fish as available. Includes acrylic cover.